Lamb has been the centerpiece of our Easter feast for many years. 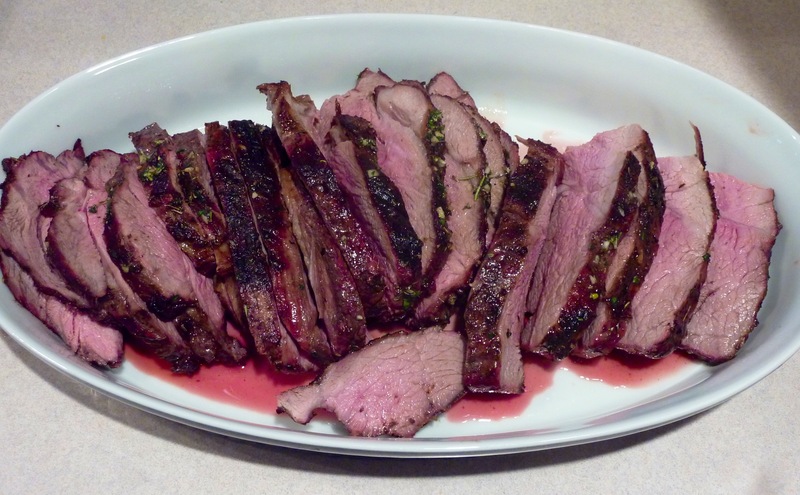 I have prepared it a number of ways but have found grilling a boneless leg of lamb to be a very flavorful way to cook lamb for the holiday. An added bonus to this method is that, because the lamb is cooked outside on the grill, it frees up the oven for other dishes when cooking for a crowd. Read the recipe carefully before you begin so as to allow yourself time to marinate the lamb. I was inspired to prepare this dish from Frances Mayes The Tuscan Sun Cookbook: Recipes From Our Italian Kitchen. She uses a method for grilling steaks that I had not seen before: after the meat is grilled she immediately dips it in an herbed olive oil bath. I tried it with grilled lamb and let the hot roast sit in the bath for 10 minutes before slicing. The meat was pink, moist, tender, and absolutely delicious. If you can find it, my favorite brand of lamb is Morgan Valley, raised in Utah. Happy Easter! Begin by marinating the lamb. Season the outside (uncut side) of the leg of lamb with 1 Tbsp. red Hawaiian sea salt. Open the lamb to lay flat, cut side up. If it does not lay flat, cut the meat slightly in the middle; it must be flat in order to grill properly. Season the inside with the remaining 1 Tbsp. Hawaiian salt. Drizzle 4-5 Tbsp. olive oil over the cut side. Lay garlic slivers on the meat and sprinkle with lemon zest. Transfer meat (still cut side up) to a large platter. Cover with plastic wrap and let marinate in the refrigerator for 4 hours. Bring lamb to room temperature 1 hour before grilling. Make the olive oil and herb bath by combining all ingredients and whisking until smooth. Remove 1/4 cup of the bath and use as a basting liquid during grilling. Set the rest aside to use as the bathing liquid as soon as the lamb is finished grilling. Preheat the grill to 450 degrees or set on high. Sear lamb on all sides (4-7 minutes per side), then lower the temperature to medium, put the cover down, and let the meat grill, turning every 20 minutes. 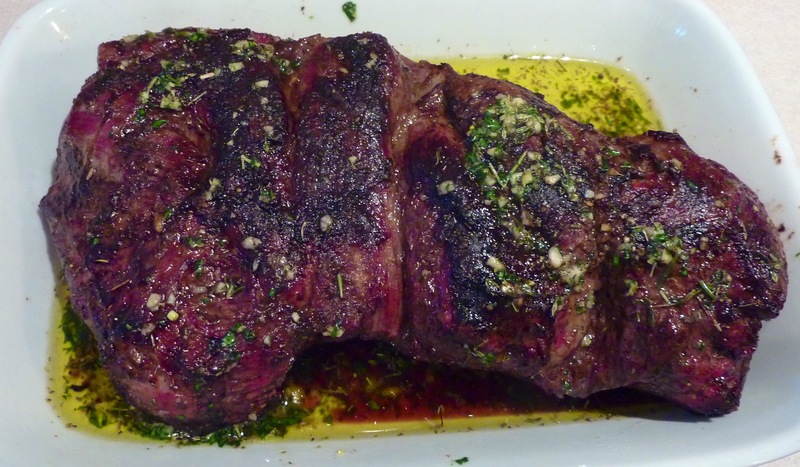 Baste with the 1/4 c. olive oil and herb mixture after the first 45 minutes. Use all of the 1/4 cup. You will grill the meat for a total of 1 to 1-1/2 hours or until the meat is 125 degrees internal temperature at the thickest portion for rare meat (use an instant read thermometer). Remove from the grill and immediately bathe both sides in the olive oil and herb bath set aside earlier. Let meat sit in the bath for 10 minutes, tented with foil, then slice. Serves 10-12. This entry was posted in Easter, Lamb, Meat Dishes. Bookmark the permalink. My mouth is watering. I think I’ll have to try this for our Sunday fest. Where do I get the Red Hawaiian salt and the Greek oregano? I think I have everything else. It really is good. I should have put in the notes depending on your grill it might take less time to cook, but if you go by temperature it ought to be fine. You can get Hawaiian red salt at the Korean Market on State Street. The Greek oregano comes from San Francisco herb. I can run some over to you to try if you would like.